Saare jaahan se achha Hindustan hamara, this is the whole point about patriotism. It presents a singular, special, perfect us-and an undifferentiated, undesirable, undeodorised them. The pism, per se, has to be egoistic and dismissive of everybody else. It’s a bit like getting into a local train at peak hour; you can’t ensconce yourself in smug comfort without crushing the toes, smashing the ribs, and gouging out the eyes of all the other commuters. As practiced in our times, it is religion at its worst . It’s the opium of the masses. The canons of morality and logic are lost on it. All that is expected of the patriot is blind devotion to an abstract entity called the state or whatever symbolizes the state. In the quiet of patriotism, people become a faceless monolith and willing to believe a thousand lies. Patriotism has to be highly conceited, and completely unapologetic about dismissing the saare jaahan simply to show how achha is Hindustan hamara . Anthems do rather badly on the credibility Index because they all make the same claims. You may stand proudly minding your own P, but you’ll find a whole Q of guys doing exactly the same about their country. 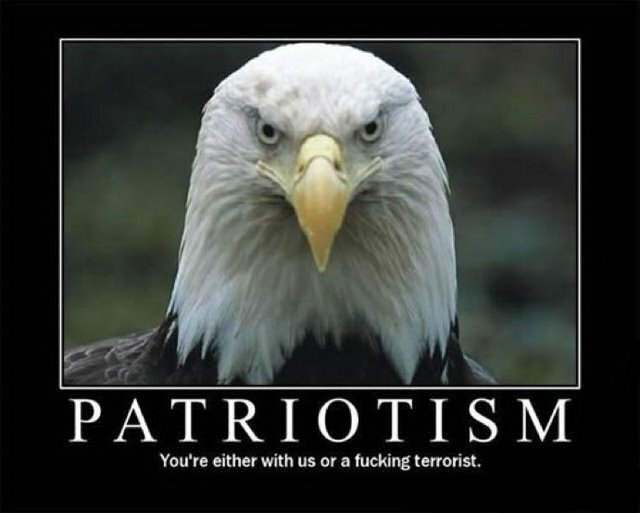 One man’s patriotism has to be another country’s disparagement or even another man’s terrorist movement. What Voltaire said about religion applies equally to this another opiate, “It’s a fraud, but it must be maintained for the masses.” It sells flags at zebra crossings on Independence Day. Mangal Pandey is resurrected outside history because patriotism has become a money-spinner. The state used patriotism to cover up its lies and kill dissent. Private capital an opportunity in the same fervor to sell its commodities. Patriotism is not a choice but an order. For long we have believed that patriotism is the glue that holds the nation together. The nation it may have, but not the people. Individual and community enterprise is better served by questioning the abstract and dangerous entity called patriotism. Even patriotism will be thus served better. We should redefine patriotism, the way Gandhi did : “by patriotism I mean the welfare of all the people”. Who all are included in this sect ‘all people’.? Does it include only the people of one’s own country? Henry Kissinger said that when nations pursued their self- interest, it led to a balance of power, predictability and peace. President Bush refused to shift to unconventional sources of energy, in the interest of US economy. US foreign policy aims at controlling oil producing countries like Iran and Iraq to satiate its power hunger. As evident, pursuing self interest doesn’t bring peace. However it does result in a war for power. ‘All people’ should therefore mean, all of us, human beings. As Pablo Casals says ‘love for one’ s country is a splendid thing, but why should love stop at the borders?’ Love your country, cherish its symbols, but respect the other nation as well. Work for the welfare of your people but take care, the welfare of ‘Your people’ should not harm others. “ there will be no end to the troubles of states, or of humanity itself, till philosophers become kings in this world, or till those we now call kings and rulers really and truly become philosophers, and political power and philosophy thus come into the same hands”.